Auschwitz-Birkenau concentration camp survivors have been among those marking the 65th anniversary of its liberation at UK Holocaust Memorial Day events. Many attended a national commemoration at London's Guildhall, with other survivors of genocide and politicians. In a statement, the Archbishop of Canterbury urged people to hear their stories and remember their legacy. He also warned against "attitudes in ourselves and in others which were the harbingers of the Holocaust". Among the survivors at the Guildhall was Lilly Ebert, 79, from Golders Green, north London, who was taken to Auschwitz with her family in 1944. Politicians and dignitaries filed into the great hall giving out polite handshakes. The Holocaust survivors greeted each other with bear hugs and knowing smiles; long-lost friends with a shared past. The ceremony began with the crystal clear voices of a school choir, silhouetted against a backdrop of grainy black and white images. 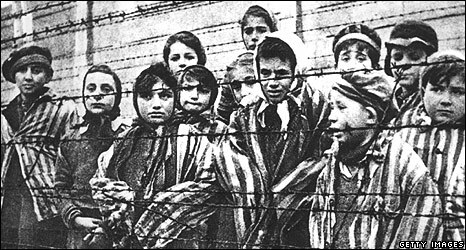 Forever associated with the horrors of the Holocaust, emaciated faces stare soullessly from behind the barbed wire of concentration camps. It's hard to believe some of those skeletal figures shivering in Eastern Europe's icy winters are sitting here, surrounded by the families they went on to build. They too have been affected by the horrors their parents suffered. At the back, one woman kept her hand on the door for a swift exit. She and her sister both suffer from claustrophobia. "Too many stories about gas chambers and cattle trucks from my parents," she explained. She remembers her time in the largest Nazi concentration camp "so vividly, it could have happened yesterday" and remains traumatised by the experience. "The most important thing is to be alive," she told the BBC. "It's important to be tolerant with each other. It makes no difference what religion you are or the colour of your skin." The theme for the 10th annual Holocaust Memorial Day is Legacy of Hope, which focuses on the lessons future generations can learn from the Holocaust. Holocaust Memorial Day Trust chief executive Carly Whyborn said the words of Holocaust survivors should set an example. "They don't talk about revenge or hatred, they don't talk about enacting revenge on anybody, they talk about hope, they talk about creating a cohesive society for all of us," Ms Whyborn said. In a statement to coincide with the memorial, the Archbishop of Canterbury, the Most Reverend Rowan Williams, warned against "dehumanising attitudes". "We need to be vigilant about every expression of ungenerous feeling towards people in need and all who may for a time be dependent on the wider community - the refugees and asylum seekers," he said. "We need to be alert to the signs of a casual attitude to the value of human lives, whether by acts of terrorism or more subtly, in relation to disability, or the beginning or end of life." Arriving at the Guildhall event, Conservative leader David Cameron told BBC News it was a "fantastically important" anniversary. "It is important to remember what happened in the Holocaust and it is important to remember how many genocides there have been since then. "Just looking at the pictures of the survivors with their children gives me immense hope that we can do better in future." Harry Spiro, who was the only one of his family to survive the Holocaust, said he found Wednesday's ceremony "very moving". After the war he was one of some 700 orphans from the Holocaust under the age of 16 to be allowed to come to Britain. Mr Spiro, 80, said he was pleased that after so long people still want to know about what happened. He took his own grandson Ben to Treblinka camp in Poland where his family was killed and told him: "If you come across people who say the Holocaust never happened you can say it did happen because I was there." Holocaust Memorial Day is marked with the intention of remembering and honouring the victims and survivors of the Holocaust and those from subsequent genocides in Cambodia, Rwanda, Bosnia and the ongoing atrocities in Darfur.